Come in, join us, and have a virtual drink. It’s a quiet celebration with just a few close friends. Pliable celebrates with Elizabeth Schwarzkopf in 1979. For the full story of this photo see below. Exactly one year ago today the first post was uploaded on this blog. Now I’m 166 posts further down an overgrown path. I haven’t changed the world, but I never set out to do that. But the blog has found a voice of its own, and more importantly has also found an audience. It has carved out a place in the new fangled blogosphere. Tracking service Technorati currently rates me 35,855 out of out of the 15.5 million blogs it measures. That puts an overgrown path somewhere in the top 0.25% of all blogs, which for a 'serious music' site covering a lot of early and new music, from Filipe de Magalhaes to Odaline de la Martinez, is very pleasing. Around 500 new readers come on board every day, and an impressive number take RSS feeds. And I know from my IP logs that some surprisingly influential organisations are regular readers. Search engines also like me. Type on an overgrown path into Google, and you will see an amusing example of the child consuming its parent. The first two search results refer to this blog. Quite ridiculously the leading search engine now rates the blog as more important than the sublime piano composition by Janacek that inspired it. But enough of speeches and self-promotion, you are only as good as your last post in this business. Time though for a quick thanks to my fellow bloggers. I’ve never come across a more co-operative and supportive group. Music bloggers define a community of common interest, long may they prosper. Thanks also to Blogger which powers me. But the biggest thanks to you the readers. Without you none of this would have been possible. Thank you for being one of those close friends over the past year. Because I blog under the web name of Pliable (which was taken from the character in Bunyan's Pilgrim's Progress) I receive a lot of emails asking whether I really exist. My wife will confirm that the credit card bills for CDs, books and concert tickets definitely prove I do exist. But just in case there is any doubt, I have included two previously unpublished photos (© 2005 On An Overgrown Path) which portray two remarkable women. 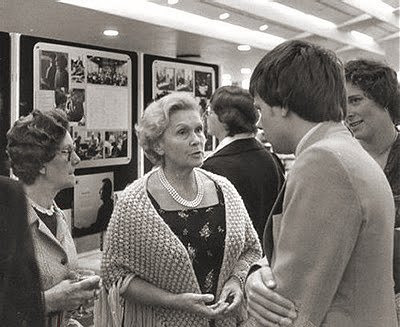 The photo at the head of this post is me talking to Elisabeth Schwarzkopf at the Royal Festival Hall, London in 1979 (you can date it from my hairstyle). Schwarzkopf’s husband, and recording legend, Walter Legge had died the previous month (the lady to the left is Miss Jane Withers, Legge's long-serving secretary). The Philharmonia Orchestra, which Legge created as a vehicle for his recording activities, had asked me to create a tribute exhibition at short notice. Some of the material was taken from my own personal collection. Elisabeth Schwarzkopf was delighted with the tribute, but was far less impressed with my description of Legge as an ‘entrepreneur’. (See My first classical record). When the photo was taken I think I was trying to explain to her that ‘entrepreneur’ was a complimentary description. But I am afraid she was not persuaded (or was I distracted by those pearls?). The photo immediately above was taken in Paris in 1978. Karajan and the Berlin Philharmonic were playing two concert in the historic Théâtre des Champs-Elysées (venue for the infamous first performance of the Rite of Spring). Alexis Weissenberg was then Karajan’s ‘court’ pianist rather as Siegfried Lauterwasser was his ‘court’ photographer. (See my post Downfall and the mystery of Karajan’s personal photographer). I was working for EMI/Angel, and we were recording a cycle of the Beethoven concertos with Karajan and Weissenberg. In the photo my long suffering wife Sorojoni (sorry I can’t do the dishes tonight darling, I have to get that Perotin MP3 link working) is talking to Weissenberg. I rather think she is telling Alexis that she prefers her fellow South American Claudio Arrau’s interpretation of the Beethoven…. Many thanks for following my overgrown paths. I haven’t any real regrets. But I do wish I was able to devote more space to my other loves of jazz, architecture, art and poetry (follow the four links for personal favourite posts on those subjects). So here, in conclusion, is Leonard Cohen's The Only Poem which very neatly sums things up the last twelve months on an overgrown path - cheers! If you enjoyed this story follow this link to the very first tentative post on an overgrown path - we've come a long way since then! Happy first anniversary, pliable and "on an overgrown path"! You are a 21st c. lighthouse for the wide world of music -- from very early music to very new music to jazz! I wish you many many more years of music writing and cultural,ecological, and spiritual advocacy! And thanks for sharing the wonderful personal photos of you, your wife, Ms Schwarzkopf and Mr Weissenberg! 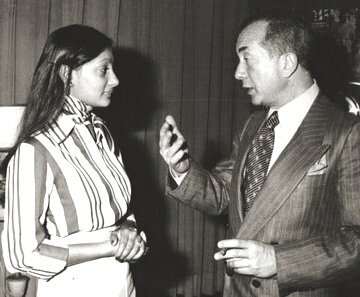 Interestingly, I attended a master class given by Ms Schwarzkopf, at the University of Maryland, at about the same time -- 1979. Also at that time, I recall, the University hosted a master class with Peter Pears. Those were very memorable days for a young musician, and you seem to have been very much at the center of the classical music universe -- as you are again today! In this first anniversary week it is pleasing to see On An Overgrown Path featured this morning's Guardian (27th August 2005).